The India Post, 1st January, 2009 :There are several ways of commencing a new year. According to the Christian calendar 1st January marks the beginning of the year, the financial year begins from 1st April, the Hindu new year from the first day (Pratipada) of the month of Chaitra from the Hindu lunar calendar, the commercial year from the first day of the Hindu lunar month of ‘Kartik’, the solar (soura) year, the lunar (chandra) year, the luni-solar year and so on. In all these the year comprises of twelve months. Who first proclaimed that a year should consist of twelve months and how did the world come to accept it? The foremost exponent of this concept is undoubtedly the Vedas, the most ancient literary texts. The Vedas say ‘A year consists of twelve months’. It is because they say so that the world has accepted it. Out of all these days of beginning a year the most ideal one is the first day of the month of Chaitra according to the Hindu lunar calendar. There is no explanation as to why the 1st of January is the beginning of the new year. Someone conceived that it should be so and thus it began. Contrary to this there are natural, historical and spiritual reasons to mark the commencement of the year on the first day of the month of Chaitra. 1. 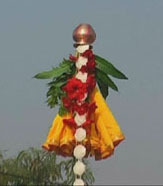 Natural: Towards the first day of the month of Chaitra (Padva), the sun assumes a position above the Vasant intersection (the point of intersection of the equator and the meridians) and the spring season commences. In Shrimadbhagvadgita (10.35) The Lord says, ‘Among the seasons the exhilarating Vasant season (spring) is my manifestation’. In this season, the weather is pleasant and exhilarating. In the Shishir season (autumn) the trees shed their leaves. Towards Padva, trees bear new foliage and appear fresh. 2. Historical: Rama slayed Vali on this day. Lord Ramachandra returned to Ayodhya after slaying the evil demons and Ravan on this very day. The Shakas too defeated the Huns on this day. This day also commemorates the commencement of the Shalivahan calendar after Shalivahan vanquished his enemies. 3 A. Creation of the universe: Since on this day Lord Brahma created the universe and the Satyayug began, it marks the commencement of the new year. 3 B. One among the three and a half auspicious days (‘Muhurts’): Gudhipadva, Akshay trutiya and Dasra (Vijayadashmi) each make up one, and the first day of the Hindu lunar month of Kartik comprises half of the total three and a half auspicious days. The special feature of these three and a half auspicious days is that unlike other days when one has to choose an auspicious moment to perform a ritual, on these one does not need to, as every moment of these days is auspicious. 3 C. The higher incidence of prajapati sanyukta (conjoint) frequencies on the earth: The tantra text Ganeshyamal states that in all 108 frequencies, one each from the four parts (charans) of the twenty-seven lunar asterisms from the region of lunar asterisms (nakshtralok / karmadevlok) 27×4=108 reach the earth. They disintegrate further into four types of frequencies – yama, surya, prajapati and sanyukta (conjoint). On this day the Tej and Prajapati frequencies are effective in large measures. During sunrise on this day, the Chaitanya (Divine Consciousness) emitted from these frequencies can be retained for a longer period. It is accumulated in the cells of the embodied soul and is used by the embodied soul as and when required. Therefore within 5-10 minutes of sunrise one should perform ritualistic worship of the Gudi. hindu or bhartiya calender by which name we call it is more humane & scientific . we are not required to woke upnin midnight & change date our day starts with rising of sun.